When I first began expanding my collection, I was so enamored with the hundreds of exotic species available from far away locales that I all but ignored some of wonderful tarantulas that could be found in my own county. As much as I hate to admit it, I paid little attention to the Aphonopelma genus, subconsciously designating the species it contained as a bit mundane. After all, why keep a tarantula that I could essentially find in my back yard (well, give or take several thousand miles!) when I could have something found across the world? Now that I’ve established a pretty good-sized and diverse collection, I’ve turned my attention to some of the species I might have previously overlooked. Although I’ve kept an Aphonopelma schmidti for over a year, it was only recently that I had a change of heart about this genus. While looking at a fellow collector’s photos, I was taken by the gorgeous earthy grays, browns, and blonds of these spiders, something I had long admired in my schmidti. Having already added an A. anax sling to my collection, I was keeping my eyes open for a A. chalcodes. When I found a young adult for sale, I jumped at it. The A. chalcodes’ natural range is in the Sonoran deserts of southern Arizona and northern Mexico, which experience two major rainy seasons in the summer and winter. Although this animal flourishes in dry conditions, it can definitely tolerate more humid climes. In the wild, this animal experiences high temps in the mid 80s in the summer, and lows of 52º F in the winters. A burrowing species in the wild, the A. chalcodes would avoid both of these extremes by retreating to its den. With this in mind, I set my chalcodes up on four inches of dry substrate made up of a 50/50 mixture of coco fiber and peat. To stimulate its natural burrowing tendencies, I included a short section of black PVC pipe as a starter burrow. I also supplied a water dish and some sphagnum moss. I do not overflow the water dish. Currently, it does not use its burrow, but instead chooses to sit out in the open. This is perfectly fine by me, as this little blonde ball of fluff is quite the looker. This is a species that does very well at room temperature. Mine is currently kept between 70 and 75º F; in the summer, this range will be between 75 and 85º F. For folks who have colder temps in their homes during the winter, this would be a good spider to consider keeping. 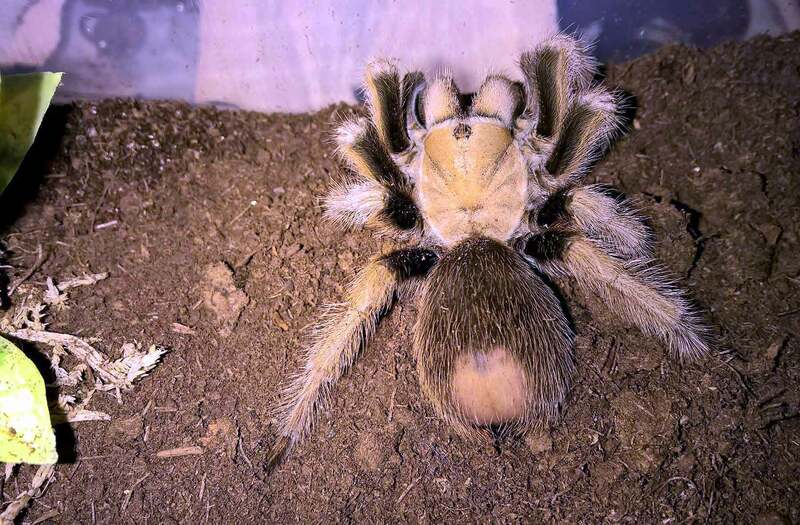 Species in the Aphonopelma genus are notoriously slow-growing, and the chalcodes is not an exception. Although keeping this animal at higher temps will stimulate its metabolism, leading to faster growth rates, you can still expect this spider to take many years before it reaches maturity. Males of this species are expected to live 5-8 years, dying a year or two after reaching sexual maturity. It is estimated that a female could live 25+ years. The A. chalcodes is a medium-sized tarantula reaching a max size of about 6″. So far, mine has proven to be an excellent eater, and I’m currently feeding her 2 large crickets a week. However, I have noticed that my other Aphonopelmas seem to pick up on environmental factors during the late fall months, and they will forgo eating for most of the winter. In the wild, this species will spend the winter fasting in its burrow, so I wouldn’t be surprised if mine did the same once the temps drop again. This spider is often recommended as a great beginners species due to ease of husbandry and a tractable disposition, and for the most part, this is a good tarantula for novices. However, behavior varies wildly between individual specimens. Many folks report their chalcodes being a bit more feisty and prone to biting; others keep specimens that are quick to kick hairs. This information is important to keep in mind when performing maintenance or interacting with your animal. My A. chalcodes can be a bit skittish, but she has yet to show me a threat pose or any defensive behaviors. Still, her bald abdomen is an indication that she may kick. The A. chalcodes is a beautiful, relatively calm spider with easy husbandry requirements that make it a wonderful addition to any collection. If you’re a collector in the States, don’t make the mistake I did and pass up this little gem. ← New England Reptile Distributors (NERD) – A Review! Another of my favourites! 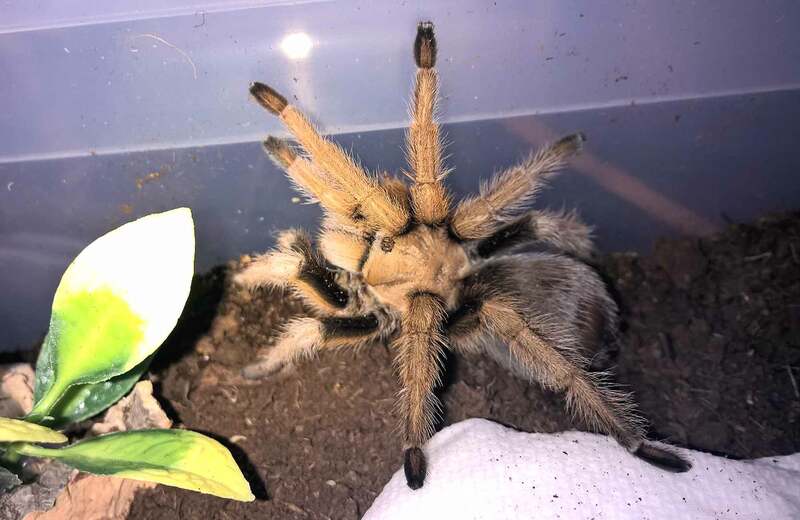 My female actually came to me in error when I ordered a maule (like you, I’d bypassed this particular tarantula since it looked somewhat dull in the photographs – boy was I wrong). The maule was sent as soon as I noticed the mistake, but I also got to keep my chalcodes girl, Storm. She’s remarkably placid; another of mine who could burrow if she so desired but doesn’t (I do strongly feel that this has a lot to do with the temperatures in different homes in different countries, as none of my British friends with this tarantula have ever seen one burrow either, but we’ve all heard that they do). Also very lazy, in that she doesn’t really do much aside from sitting around looking beautiful! I’ve had her for almost two years, but no signs of a moult yet, and until last weekend she was fasting for nine months. I’m telling you, the Aphonopelma genus has become a new favorite. I made a mistake by passing these guys over when I first started collecting because I felt that spiders from the US weren’t “exotic” enough. Love the name “Storm!” Yup, my chalcodes made a huge impact on me and the rest of the family when I first acquired her. Everyone was just floored by how gorgeous and, shall I say, “cute” she is. Just a little blond bundle of fur! Although I’ve heard stories of high-strung individuals, mine has been nothing but a total sweetheart. My first tarantula, although not my first exotic pet (I’m 59). I just purchased a juvenile desert blond. She’s really something (I’m going to assume female until I find out otherwise). I enjoyed your article and little video. Hope to learn a lot. Hardest thing may be leaving her alone but at least I have 6 other animals that require my attention so I will just enjoy watching her. My apologies for the delay in responding…I never saw this! I’m so glad that you enjoyed the article. The desert blonds are a wonderful species; so fluffy and cute even! Sounds like you have a sweetheart! I just received a 1st install (post EWL) spiderling. He/she is soooo tiny. Within a few hours of arrival he’s dug a burrow in his vial and eaten two fruit flies. I hope to have him for a decade or her for 3! Thanks for the info. Congrats, Matt! Yup, you might be leaving that one to your grandkids…they live forever. Thanks, and so sorry for the delay!